OK, so Tiger has done it again. It was an enthralling US Open that was action and drama packed right to the end. Who would have thought it would take 91 holes for Tiger to beat Rocco Mediate, the 157th ranked player in the world? My hat goes off to Mediate. If my memory serves me correctly the last time I heard from him (before this week) was when he was commentating on the PGA Tour last year. I think he was injured and provided some special comments to assist those regular commentators who have long ago forgotten anything useful and interesting to say. Anyway, bad luck to Rocco, he certainly provided some entertainment and I hope it’s not the last time we hear from him. If this week’s form is anything to go by the old boy has plenty to offer. I’ve been asked many times why Tiger is so good and what separates him from the rest. Before I do that I would like to give you my opinion on the areas I think are myths as to why he is the best player in the world. He is the hardest worker: This one annoys me. I don’t believe Tiger is the hardest worker on tour. Sure, he practices hard but so do most of the tour players. Vijay Singh is renowned for spending hours beating balls. I’m sure there are others too that would give Tiger a run for his money in terms of hours spent practicing. I don’t think Tiger’s work ethic hurts him, but I don’t think it’s the primary reason why he is at number one. If practicing long hours was the only requirement for achieving success the world be full of people hitting golf balls all day. He is the fittest (strongest) athlete: Again, Tiger is fit and strong but is he really the fittest? And if so is that the reason he keeps winning? I don’t think so. This fittest tag gets thrown around by the media from time to time when they run out of things to say. It’s a bit of a cop out if you ask me. The PGA Tour is full of extremely fit and strong athletes. John Daly is definitely the exception. The fitness trailer get far more action than the 19th hole! Things certainly have changed from a few years ago. I know amateur golfers here in Melbourne that workout each day and have the build of elite football players. Again, being fit and strong can’t hurt Tiger’s game, but I don’t think it’s the reason why he’s number one. Also it seems Tiger can know win on one leg. I’d bet that Tiger could beat these guys if he was twice the size, with a sizable beer gut. He wants “it”more than any other player: This line is a complete cop out. You can’t tell me that Rocco Mediate wanted the US Open any less than Tiger. Every player that’s competing out there wants to win and win badly. Tiger likes to win, but his competitive nature is not the reason why he is able to win so often. So why is Tiger so good? My strong opinion is that he is the most automatic and natural sportsman in the world. Tiger plays every round the same way. He has grooved his thought process so that every shot is treated like the one before it. The more pressure he is put under the more instinctively he plays. Tiger never plays safe! Never. My definition of playing safe is being careful, using too much conscious control and letting the pressure of any situation change your natural style. It can seem like the right thing to do, but playing safe almost always leads to failure. Through years of experience Tiger plays each shot like it was his last. Sounds easy to do but it isn’t. I think it’s human nature to be careful and play safe when put under pressure. Tiger has the ability to play without fear or results of the consequences. This I believe is what makes him so special. The average golfer has trouble letting go and trusting himself to hit his opening tee shot – much easier to tighten up and steer the ball down the fairway. This is something that I’ve never seen Tiger do. Every swing, chip and putt is a flowing action that is free of self-doubt or worry. The ability to do this cannot be underestimated. Not only does it help him play those incredible shots, it allows him to grind out those rounds where things aren’t going so well. To keep swinging freely when you’re not feeling great and the ball keeps missing the target takes more courage than anything golf can throw at you. Hit every shot with a free flowing swing. Hit the ball (including putts) without fear or concern of where it’s going. Sure, plan the shot and choose the appropriate club, but once you’re over the ball you can’t worry yourself with self-doubt and fear. Let go and enjoy the experience. This means that if you have a testing three footer for par you have to walk up and stroke it with confidence. Or, if there’s a difficult tee shot with out of bounds down the left you can’t aim at the right trees and play safe. You must aim for the fairway and pull the trigger. It also means that if you hit your first three tee shots into the trees you can’t analyse and start changing your swing and try and get the ball on the fairway. That’s cheating and isn’t in the rules. You have to hit the fourth tee shot with you most natural swing you can muster. 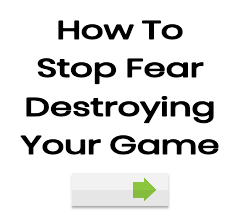 If you lean to adopt this “free from fear” method of playing you can then take better advantage of any fitness gains and competitive spirit that you may possess. You can only get an advantage from these “one percenters” if you can swing (play) without fear. And finally, I’ve just heard that Tiger is taking the rest of the year off to recover from injury. I’m sure this won’t stop him and he’ll be back next year in the same way that he finished this one. I can’t wait! Good golfing and good luck. Let me know if you decide to give the challenge a shot. I was belting some great drives early around Bonnie Doon today but then got to a short tightish par 4 and thought, best play safe..duck hook…lost ball…round on the downhill slippery slide.. Yes, trying to play safe, that is being careful and not letting go, is not the right thing to do. Perhaps next time you could take your 4 iron and make a free flowing and automatic swing? Letting go definitely doesn’t mean you can hit the driver on every hole. Sometimes you have to play conservatively! what I found quite fascinating (and impressive) was Rocco Mediate’s ability to continue playing his own game even when he got behind early in the 18 hole playoff. He kept playing within his limitations, using the strengths of his game and didn’t get sucked into trying to play Tiger’s game ! I agree. Rocco was fantastic. I hope he is able to repeat his stellar play in future and hopefully inspire some of those younger guys to take it up to Tiger more of the time. Tiger is great for golf – if he had more competition the game would be in a stronger position. i am taking up this challenge.ive spent hundreds of hours reading books,looking on the internet for golfing secrets,taken lessons from club pros and wasting time and money doing so.what ive read on this site i completly agree with! i cant wait to play a fun,fearless and natural game of golf.thanks! !